Spring is here and that means it’s time for the quarterly Car Show & Farmers Market from 10:00 am – 3:00 pm on Saturday, May 14 and a Sunny Serenade Concert Saturday, May 21 beginning at 7:30 pm. Both events will take place at Heritage Park (19200 Collins Avenue) and have been a reoccurring staple in the City for several years. 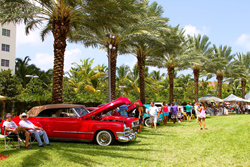 Join the fun on May 14 as some of the best show cars in South Florida come out and shine in the city’s premier park. Vote for a favorite car. Contest winners will split $500 in cash prizes. Food, produce, art, and crafts vendors will be open along with entertainment throughout the event, running from mid-morning to early afternoon. Saturday, May 21 from 7:30 to 9:00pm in the evening, one of South Florida’s hottest party bands will bring the Sunny Serenade Concert season to an end in style! Spend the evening moving to the groove of the Ignite Band, dancing and singing along to the music. Be sure to check the calendar in September when the Concert Series returns. These outdoor May events are free and open to the public! The SIB Shuttle bus provides free transportation, within city limits, or free event parking is available in the Heritage Park Parking Garage and under the William Lehman Causeway. Cultural trips offered in May are a tour on Sunday, May 15 of the Deering Estate which includes an Ethnobotany lecture ($18 Residents/$23 Non-Residents) and a trip on Tuesday, May 24 to Sawgrass Mills Mall in Sunrise ($5 Residents/$10 Non-Residents). Sign up for summer programs, classes and cultural events begins May 9 for residents and May 23 for non-residents. For a full listing of the next season’s programs and events, stop by the Government Center or Pelican Community Park to pick-up a copy of the summer edition of the Sunny Isles Beach Living Magazine, available May 5. For more detailed information about programs and events in the City visit the official City website at sibfl.net, watch SIBTV, or follow the City on Twitter & Instagram (@CityofSIB), or on Facebook (City of Sunny Isles Beach). For questions, please contact Cultural and Community Services at 305.792.1706.